Activision has announced Pack bonuses for those who pre-order the upcoming 007 Legends video game. Pre-orders from Amazon.com will get the Nemesis Pack. Play 007 Legends through the eyes of two notorious Bond rivals - Jaws and Baron Samedi. With the Nemesis Pack, gamers get to play as Moonraker's space-suited henchman or Live and Let Die's voodoo king sporting his iconic skeleton paint in the Legends and multiplayer split-screen modes. Pre-orders from GameStop get The 007 Pack. Players will be able to dress for success in split-screen multiplayer mode with an exclusive James Bond character outfit, and additionally, use the most famous of James Bond's handguns - the Walther PPK pistol. With the 007 Pack, fans also get early access to the Fast Switch gadget, which increases weapon swap speed by 50%. 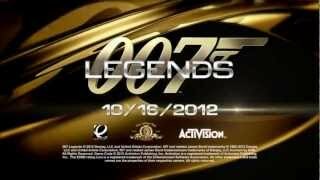 007 Legends features an original, overarching storyline tying together five classic Bond movie-inspired missions, plus a sixth mission based on this year's highly-anticipated movie - SKYFALL - which will be available as post-launch downloadable content. The game will be in stores on October 16th for PC, Xbox 360, and PlayStation 3.